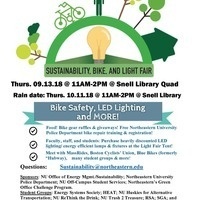 Please join us for the annual Sustainability/Bike/Light Fair! Sustainable food & giveaways, over 15 information tables. Free bike registration/minor repairs/safety training/information thanks to Northeastern University Police Department. Purchase energy efficient LEDs! Snell Library Quad is between the Snell Library and the Curry Student Campus.